I'm not a big salmon person. Paul, however, is a fan (and apparently so are Patch and Sadie since they both devoured this dish). And I liked it too, which is saying a lot! Mae was the only one who couldn't be coaxed into trying it. 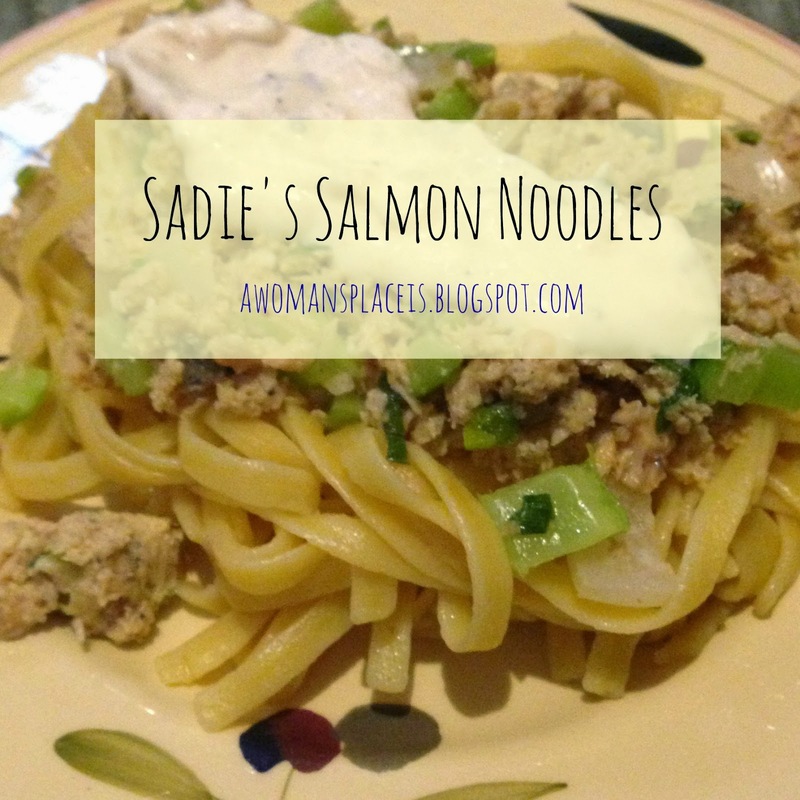 Sadie actually cooked up this recipe with a little help from me. So, apart from the chopping involved, it's pretty straight forward and simple to make (and Sadie's becoming surprisingly skilled at slicing and dicing). And so here's the latest recipe that's come out of my kitchen. It'll definitely be on the menu in the coming months on Friday nights! We began by adding the salmon to the skillet and cooking it over medium low heat. Next we threw in the ginger and garlic, sliced the vegetables while they cooked and added them as they were chopped and then we added the spices, stirring it occasionally until the dish was combined and cooked through. Then in a bowl we combined the sauce ingredients, stirring it until it was completely mixed. We usually serve the salmon over gluten free noodles or rice with the lemon ginger sauce drizzled over it. And Sadie would encourage anyone trying it to try their own twist. While flipping through on of my cookbooks she announced that it's better to be a rule breaker when cooking... so she seems to be learning that lesson from cooking with me! Ah, the valuable lesson on when to be a rule breaker. I never thought of cooking that way but it does make sense. Here we are counting down until my daughter's ginger carrot ferment is ready. How fun! I need to do a ferment with Sadie because I think she would get so excited waiting for it and it could be a little science lesson! Yum! That sounds really tasty! Thank you for sharing. It's nice to expand my Lenten recipes file.